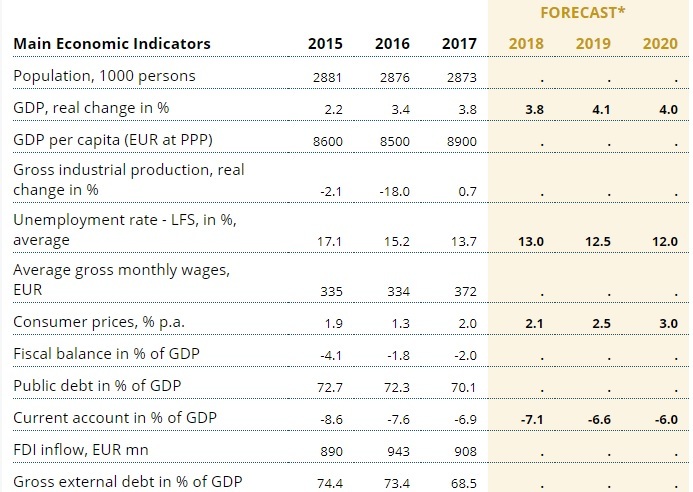 TIRANA, July 16 – The Vienna Institute for International Economic Studies has slightly revised downward Albania’s 2018 economic outlook, citing an ‘unprecedented appreciation’ of Albania’s national currency against Europe’s single currency. 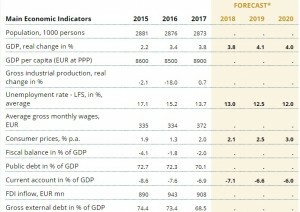 In its latest summer report on economic prospects for Central, East and Southeast Europe, the Vienna Institute for International Economic Studies, wiiw, has downgraded Albania’s 2018 GDP forecast to 3.8 percent, down from a previous 4.1 percent last March and slightly revised upward by 0.1 percentage points its 2019 and 2020 expectations to 4.1 percent and 4 percent respectively. The 3.8 percent growth scenario would be a slowdown for the Albanian economy which grew by a 9-year high of 3.84 percent in 2017 backed by major-energy-related investment currently in their final stage and the emerging tourism sector. The main reason that wiiw, one of the top centers for research in Central, East and Southeast Europe, cites for its 2018 downward revision is the ‘unprecedented appreciation” of the Albanian lek against the euro during this year. “The year so far has witnessed an unprecedented appreciation of the Albanian currency. Further volatile exchange rates are expected in the coming months owing to seasonality,” says the Vienna Institute. Europe’s single currency has been trading at a 10-year low of about 126 lek over the past month with a series of negative effects on Albania’s highly euroised economy, primarily hitting exports to the Eurozone, local producers facing tougher competition from cheaper imports and half of the country’s savings in Europe’s single currency. Meanwhile, emergency interventions by Albania’s central bank through purchases of excess euros during the past month have only managed to stop euro’s free fall in the local Albanian market, stabilizing it at the 126 lek rate, down 6 percent from the mid-January peak level of about 134 lek and 10 percent below mid-2015 when the euro’s five-year reign of about 140 lek came to an end. However, the Vienna Institute is optimistic that the emerging tourism sector and new planned infrastructure investment will keep the economy growing at about 4 percent over 2019 and 2020 at a time when TAP and the Devoll Hydropower, the two major energy-related that drove growth in the past four years complete their investment stage by the end of 2018, leaving a huge gap of about €300 million unless other major projects replace them. “Backed by a booming tourism sector, large infrastructure projects – some close to completion and new ones in the pipeline – and consumption, the economy will grow by above 4 percent in the medium term,” says the Vienna Institute. At an average of about 4 percent over the next three years, wiiw expects Albania to register the highest growth among the six EU aspirant Western Balkan countries where overall growth is expected to drop from 3.6 percent in 2018 to 3.2 percent in 2020, mainly because of a significant slowdown in Serbia, the region’s largest economy. Prospects in the Western Balkan countries have improved significantly thanks to fiscal easing, progressive integration into international production networks and the latest rating upgrades, says the Vienna Institute report, adding that foreign direct investors are becoming more and more active in the EU aspirant region which is gaining importance as an alternative to the increasingly expensive EU-CEE countries. The Vienna Institute’s forecasts are almost in line with the Albanian Socialist Party government’s optimistic scenario of growth picking up to 4.2 percent in 2018 and gradually accelerate by 0.1 percentage points each year to reach 4.5 percent by 2021 when its second consecutive term of office expires. The World Bank and the IMF predict the Albanian economy will slow down to between 3.5 percent and 3.7 percent this year as two major energy-related projects, the Trans Adriatic Pipeline and a large hydropower plant, complete their investment stage by the end of this year. The Vienna Institute has earlier warned the public private partnership-channeled infrastructure investment that the Albanian government is implementing could boost growth in the medium-term but pose certain risks in the longer run. The Albanian government’s ambitious €1 billion PPP project has come under fire by international financial institutions and economy experts worried over the effect it will have on the public debt and efforts to bring it down to 60 percent by 2021, because of new potential accumulated unpaid bills to private concessionaires. Albania’s public debt currently stands at about 70 percent of the GDP, a level considered too high for the current stage of Albania’s economic development. An earlier Vienna Institute study has shown no Western Balkan country, including frontrunners Montenegro and Serbia already holding accession talks, will be able to meet EU accession criteria before 2030. The wiiw baseline scenario sees tiny Montenegro reaching the level of governance required to join the EU in around 12 years, followed by Serbia in 13 years, Albania in 15 years, Kosovo in around 18 years, Macedonia in 21 years and Bosnia and Herzegovina in 23 years. In late June 2018, EU leaders at the European Council decided to delay Albania’s opening of EU accession talks for mid-2019 requiring the Balkan country to show more progress with reforms in the judiciary, tackling high level corruption and organized crime.